Leaning walls are a serious issue for many homeowners in Iowa and Nebraska. These problems are a result of foundation issues. If your foundation walls are leaning or bowing inward, it may cause other structural issues throughout the home, such as cracks and water seepage. At Jerry's Waterproofing, we have experts that specialize in leaning wall repair for residents in the Iowa and Nebraska area. If you have any of these issues, it's important to divert water away from the foundation to prevent wall cracks. Make sure your gutters are cleaned out by removing debris and leaves. Also, avoid over-watering plants next to the foundation. This will prevent water seepage through wall cracks. Look for additional signs of foundation issues such as wall cracks, misaligned windows/doors, sloping floors, leaning chimneys, ceiling cracks or shifting foundations. 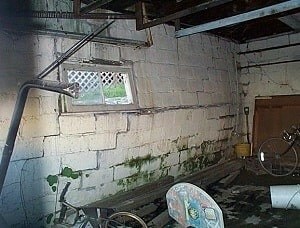 These symptoms, accompanied by leaning walls, are usually a good indicator that you have foundation failure. Jerry's Waterproofing offers several foundation repair solutions for residents with leaning walls in Iowa and Nebraska. One solution is helical tiebacks and plate anchors. 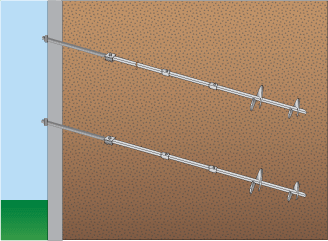 When installed into the ground, the screw anchor acts as a bearing device. First, a small hole is drilled through the foundation wall. Helical anchor sections are screwed through the wall into the ground. Once the appropriate distance is reached, a wall plate is attached to the foundation wall. All the components are tightened and secured to keep the foundation stabilized. If you have leaning walls in your home, contact Jerry's Waterproofing today. Avoiding the necessary repairs could make the situation worse over time. We offer the latest foundation repair products by Earth Contact Products to straighten your walls back to normal. We are your leaning wall specialist in Iowa and Nebraska.